Woman needs wheelchair ramp access to home in Indianapolis. INDIANAPOLIS — A northeast side woman says she has tried over and over again to alert her apartment complex about how dangerous it is to get to her aunt. Three times a week, Sheila Phelps struggles to get to her dialysis appointment. A-Team Transport has to figure out how to get her down three steps, in her wheelchair, every time. "It's definitely a safety issue. We contacted the apartment complex back in August," Sheronn Hooks, of A-Team Transport, said. "We knew once the snow came it was going to be a lot more difficult to get her in and out of her apartment." Cassidi Phelps lives with her Aunt Sheila, who has one leg amputated. 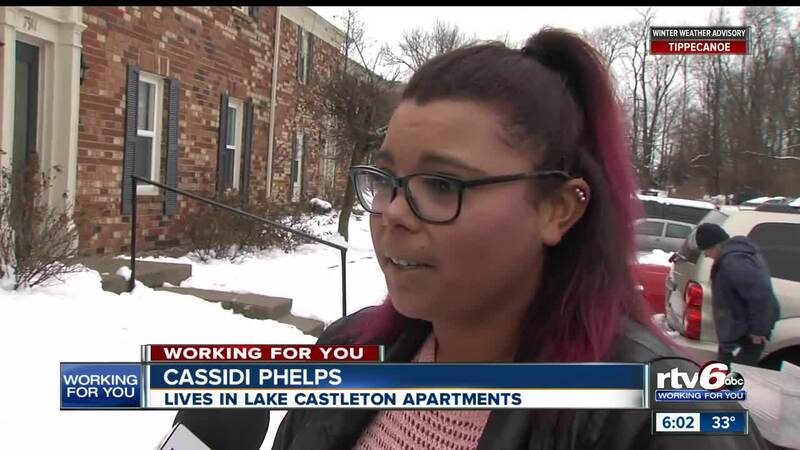 Since moving into Lake Castleton Apartments last July, Cassidi says she has communicated her concerns about getting a wheelchair ramp outside of their apartment. "It's really scary trying to take her up and down those, especially since last week her wheel popped off," Cassidi said. "I talked to the apartment since July about this and they just won't do anything." The apartment right next door to the Phelps' has a handicap accessible ramp, however, the apartment complex tells her it will cost $2,000 in order for them to install. "She is an elderly lady, with a handicap, on a fixed income and she doesn't have $2,000 to build a ramp," Hooks said. "I figured they would make some kind of accommodation for her. Which I've been doing this for 18 years and I've never known an apartment complex to not accommodate somebody in her condition." Sterling Group, owner and manager of the Lake Castleton Apartments, said the company takes every allegation regarding its properties and every complaint from its tenants seriously. Joseph M. Scimia, senior vice president and general counsel for Sterling Group, told RTV6 in an email that the $2,000 quote is accurate and that because installation of the ramp did not meet the landlord's policy for making tenant modifications at the landlord's expense, Phelps was informed the ramp could be installed but it would be at her expense. Scimia also said the landlord is prepared to allow the ramp installation to proceed with plans and a contractor approved by the landlord or have the landlord install the ramp if Phelps agrees to reimburse the cost of the installation. "The landlord is also willing to allow Ms. Phelps to relocate to another available apartment unit without paying any customary transfer fees or terminate her current lease without paying any customary termination fees," Scimia wrote in the email. "The landlord would also be willing to consider other reasonable alternatives." Meanwhile, as days continue to pass, she just hopes something is done to make transporting her aunt safer. Phelps is also open to moving to another apartment where the is only one step and a long sidewalk.